Wicomico County is located in the heart of the Delmarva Peninsula at the intersection of two major highways; U.S. Rt. 50 (E,W) and U.S Rt. 13(N,S). 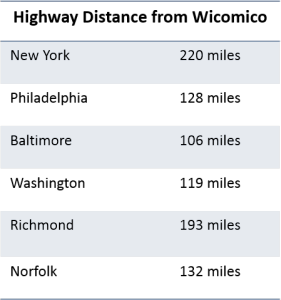 Wicomico County offers a rural location within two hours of Baltimore, Washington D.C, Philadelphia, and Norfolk.